In the CFICE context, a brokerage mechanism is an organization, person, tool, or online platform, that helps communities and campuses form partnerships. 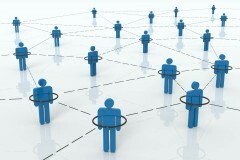 The CCE Brokering working group identifies problems found in existing brokerage models. They offer solutions for more effective community-campus partnerships through piloting new and improved brokerage models. By examining different brokerage models, this working group generates research on how to start and maintain community first community-campus partnerships. The Community-Academic Collaborative for Food Sovereignty (CACFS) project aims to strengthen relationships between academics and community-based practitioners working on national food policy issues through a food sovereignty lens. These partnerships are supported through Food Secure Canada (FSC) as part of their efforts to establish a platform through which a wide range of food sovereignty stakeholders can connect and share knowledge and experiences. In the longer-term, CACFS aims to increase the quality and quantity of community and academic-generated knowledge and food sovereignty research partnerships across Canada. Other researchers working on food security and food sovereignty will be invited to collaborate with the project by contributing to the overall budget and to the knowledge base in exchange for access to FSC’s civil society and policy contacts. This project is being co-led by Amanda Wilson, Coordinator at Food Secure Canada, Diana Bronson, Executive Director of Food Secure Canada and Charles Levkoe, Canada Research Chair in Sustainable Food Systems, Lakehead University. 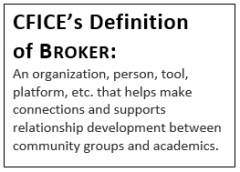 The Ottawa brokerage initiative builds off the work of CFICE Phase I partner, Ottawa Eco-Talent Network’s (OETN’s), focus on engagement with local post-secondary institutions. The OETN is a managed mentorship network whose goal is to facilitate research and knowledge mobilization that will be applied to support tangible community action on environmental sustainability in Ottawa. Jason Garlough presents on Ottawa’s brokerage mechanism. 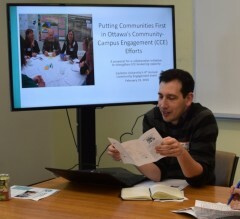 The goal of the Ottawa brokerage initiative is to facilitate community-campus connections for opportunities in research, student training, volunteerism, networking and knowledge mobilization. We are engaging Community-Based Organizations (CBOs) in the Environment sector as well as local post-secondary institutions (PSIs) to share tools, lessons, and technology developed in Phase I, and develop guidance in Phase II on how community brokers can better engage and collaborate with multiple post-secondary institutions and community organizations. Why do you connect with local post-secondary institutions? Research, interns, volunteer placements etc? How do you seek information about community-campus engagement opportunities? What information would you want in a pathways guide? This project is being co-led by Jason Garlough, Executive Director of the Ottawa Eco-Talent Network, and Eileen O’Connor, Associate Professor at University of Ottawa. Check out the CCE Brokering WG’s news, resources, and research below. Transformations through ‘Community-First’ Engagement – New Engaged Scholar Journal Special Issue!